VNPS members from several different chapters converged upon Botetourt County on August 2nd to explore three different plant communities under the guidance of Tom Wieboldt. Tom is well known as curator of Massey Herbarium, vice-president of Virginia Botanical Associates and contributor to the Flora of Virginia (to list just a few of his accomplishments). His interest to uncover interesting natural areas leads him to scouring topographic maps and long days in the field. Tom located the Patterson Mountain shale barren by observing a cliff undercut by Craig Creek and top-sheltered by sandstone. Craig Creek cuts through Jefferson National Forest, but within the horseshoes of its flat floodplain are patchworks of farms. 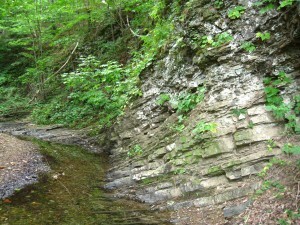 The most exemplary portion of the shale barren falls on private land. Luckily, we were able to gain permission from the landowner, Dr. Ernest Seneca to access the site. 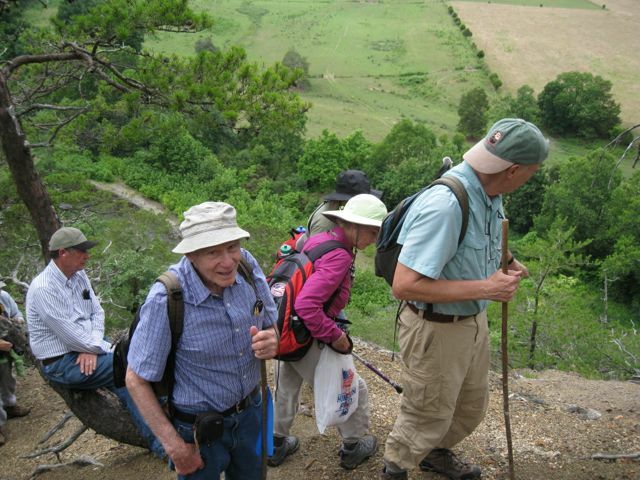 Dr. Seneca, who joined us for the trek across his property, retired from the Botany Department at North Carolina State University after 25 years as a coastal ecologist. We could not have hoped for a more accommodating steward. 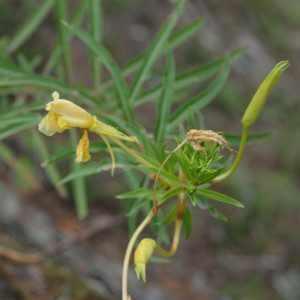 We hiked down Little Patterson Creek to its confluence with Craig Creek, where we examined the flora growing out of the cliff-side before scaling the shale barren. Pockets of Pleopeltis polypodioides, (resurrection fern), along with Asplenium trichomanes, (maidenhair spleenwort), and Woodsia obtusa, (blunt-lobed woodsia), grew alongside blooming Heuchera villosa, (hairy alum root). 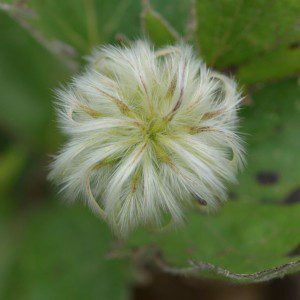 From the base of the cliff we caught sight of the feathery orbicular seed head of Clematis coactilis, (Virginia white-haired leatherflower), a shale barren endemic with a range limited to seven counties of southwestern Virginia. The Central Appalachian Shale Barren extends from SC Pennsylvania to western Virginia and into West Virginia. The conditions under which shale barrens form include: southern exposures, slopes of 20-70 degrees, and shale or siltstone substrate. The shale barrens are also characterized by around 30% vegetation cover and about 18 vascular species are considered endemic to near endemic in these “deserts of the east”. 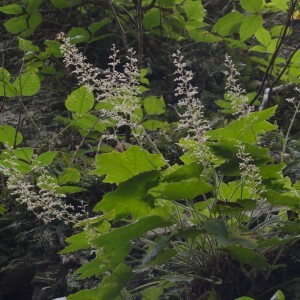 Resident flora, for which studies exist, have been described as heliophytes, as they are adapted to survive in the environmental conditions provided by the shale barren. Conditions on the barrens such as extreme surface temperature have favored species with well-developed root systems and little tolerance for shade and competition. The steepest part of the barren was sparse with stunted Pinus virginiana, (Virginia pine), Juniperus virginiana, (Eastern Redcedar), Quercus stellata, (post oak), Q. rubra, (red oak), and Q. prinus, (chestnut oak), intermittently creeping in from the edge. Eriogonum allenii, (shale barren wild buckwheat) was in full bloom, its yellow umbels complimented by its tawny leaves. Hair is a common adaptation to aid in the retention of moisture in plants growing in drought-like conditions. Scutellaria ovata ssp rugosa (heartleaf skullcap), Trifolium virginicum, (Kates Mountain clover), and Packera antennariifolia, (shale barren ragwort) were several other shale barren species we encountered on the barren. We returned by way of Patterson Mountain and where we encountered several blooming Hexalectris spicata, (crested coralroot) on the sandstone ridgetop. 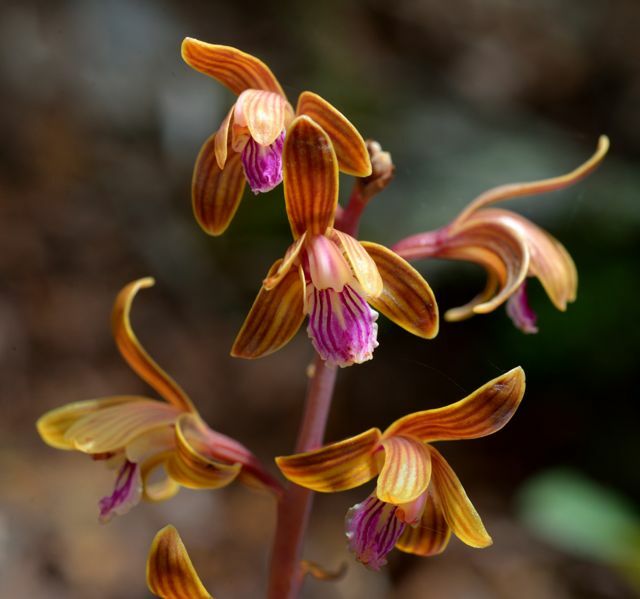 This species of orchid has discontinued photosynthesis and relies upon fungus in the form of mychorrhizae for energy. Plants that obtain nutrition in this way are called myco-heterotrophic. Our second stop was not far, but characterized by a very different plant community. 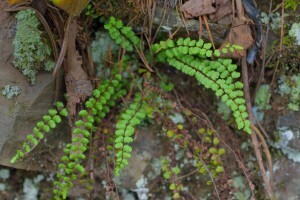 The saturated soil supported a border of Woodwardia virginica, (Virginia chain fern). The isolation of this species from its more common range in the south and central Coastal Plain, was our first indication that we were exploring a disjunct and ancient habitat. Hypericum walteri, (greater marsh St. Johnswort) was another species that is normally found in the Coastal Plain that we encountered. According to the Flora of Virginia, there are around 100 taxa with disjunct distributions between the coastal plains and mountains. The most popular explanation for this is that, the region was at one time oceanic and the Coastal Plain type flora thrived. However, when the climatic conditions shifted to continental, only pockets of Coastal Plain type flora remained in the most favorable sites. Therefore, we estimate the wetland was separated around 8,000 years ago. Tom noted that small morphological differences between these isolated and contiguous populations are likely indicators of genetic drift. 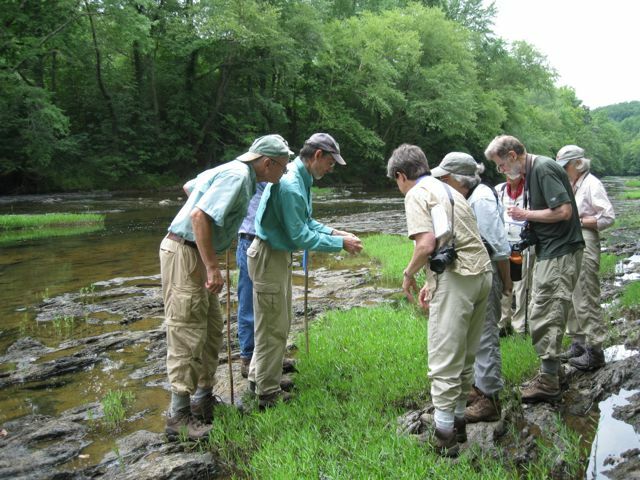 We tiptoed through Carex gyandra, (nodding sedge), Carex lupulina, (hop sedge) and Dulichium arundinaceum, (three-way sedge) in search of Virginia’s largest quillwort, Isoetes valida, (mountain quillwort). The diminutive size of the quillwort would have led me to overlook it as a graminoid in a vegetative state. As the author of the Isoetes treatment in the Virginia flora, Tom related to us the interesting aspects of quillwort biology. Quill-like leaves arise from a corm and house spores in their enlarged bases. Megaspores and microspores are housed in separate leaf bases. Quillwort identification is dependent upon a good look at the surface of the megaspore and sometimes even the microspore, and thus a compound microscope. However, megaspores were obscurely visible with a x10 hand lens. 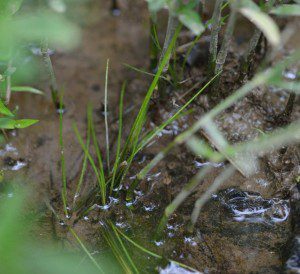 There are 17 known species of quillwort in the United States, growing in muddy substrate of still or shallow water. Ten species and four sub-species are known in Virginia, though there is speculation that this is an underestimate. The last stop of our trip was to visit the riparian flora in Craig Creek. Isoetes engelmannii, (Engelmann’s quillwort) and a hybrid between I. engelmanii and I. valida, I. 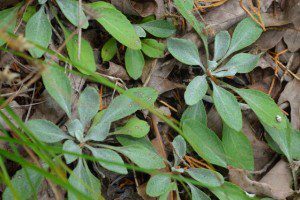 × altonharvilli, were scattered under the shelter of Justicia americana (American water willow). Though it is inconspicuous, Isoetes engelmannii is Virginia’s most widespread quillwort. I was amazed to find that I have overlooked such an interesting group of plants until now. This trip could have spanned multiple days, but we were forced to say good-bye around 6pm. However, I was often reminded of the trip for several days after due to the appearance of red, itchy welts- the much-maligned chigger, a token from the overlooked shale barren fauna! Many thanks to all who attended and made this field trip so enjoyable! Special thanks to Shirley Wilson Gay for coordinating the trip, Tom Wieboldt for superb instruction, Dr. Seneca for being a gracious land-owner and Clifford Gay for use of his pictures in this post. Braunschweig, Suzanne H., Erik T. Nilsen, and Thomas F. Wieboldt. “The Mid-Appalachian Shale Barrens”, Savannas, Barrens, and Rock Outcrop Plant Communities of North America. Ed. Roger C. Anderson, James S. Fralish, and Jerry M. Baskin. 1st ed. Cambridge: Cambridge University Press, 1999. pp. 83-98. Keener, C.S. 1983. 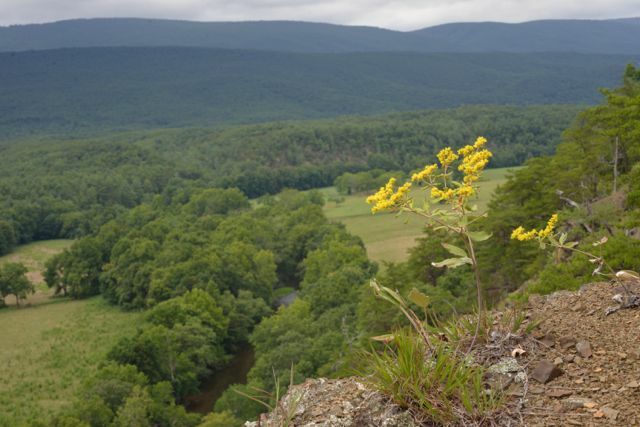 Distribution and biohistory of the endemic flora of the mid-Appalachian shale barrens. The Botanical Review. 49: 65-115. Natureserve. 2014. NatureServe Explorer: An online encyclopedia of life [web application]. Version 7.0. NatureServe, Arlington, VA.
Steele, E. S. 1911. 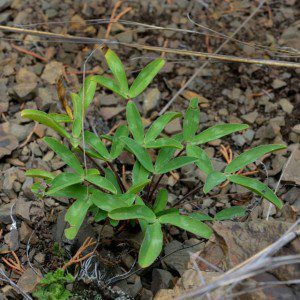 New or noteworthy plants from the eastern United States. Contributions from the United States National Herbarium.13: 359–374. Virginia Botanical Associates. 2014. Digital Atlas of the Virginia Flora (http://www.vaplantatlas.org). c/o Virginia Botanical Associates, Blacksburg, VA.
Weakley, A.S., J.C. Ludwig, and J.F. Townsend. 2012. The Flora of Virginia. Bland Crowder, ed. Foundation of the flora of Virginia Project Inc., Richmond, Fort Worth: Botanical Research Institute of Texas Press. Do you know of a source to purchase Hexalectris spicata, commonly called Crested Coral Root? I’d love to reintroduce them to our area.Thank you! Thank you for the speedy reply. I’ll check your list to see if we have a native nursery nearby.